SBG Buford’s Friday Night Lights fitness competition is set to conclude on Friday, March 29th. 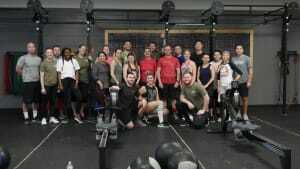 For four consecutive weeks, 5 teams comprised of SBG Buford fitness athletes have been participating in weekly workouts. Teams have been receiving points for how fast they complete the workouts, how many reps they achieve in the workouts, and on their overall participation. For the finale, we are going all out! Fitness coaches James Morton and Jonah Mathes will be running the workout, as well as throwing some tasty burgers on the grill. Athletes are welcome to bring a dessert and their own beverages. The Friday Night Lights fitness finale will begin at 5:30pm and wrap up whenever it needs to. Coach James tells us that it is a close race, and that all five teams are within striking range to win the whole thing!